End user could access their own project instances with VPN feature. Through a cloud-pipe instance which is a simple image include OPENVPN. It make user manage instance easier without lots of public ip. Per project/Per Vlan , a bunch of instance within a project will not communicate with other project instance. what about bridges creation? Is it managed by nova or they need to be already present on nova-compute and nova-network nodes? I see I can have vlan numbers not in strict ascending order, is there a way to choose the vlan number while creating a project or I have to create a project using nova-manage and then do an "alter table" to point his network on the right vlan? Can the vpn_public_address be a floating ip or has to be a nova-network's node ip? Thanks a lot for your help. I find the informations you share on you blog very helpful. bridge interface will be handled by nova-network and nova-compute. About the vlan number , just hack networks table in nova db. Check the photo in the post. As I know in current Cactus release , there's no way to specify Vlan number while creating project . We have to change it in DB. I did not check the trunk version yet. vpn_public_address is nova-network's ip by default, I check the description of --vpn_public_address , it seems possible to specify VPN ip instead of nova-network ip . First and foremost: Keep up the good work Hugo! You're blog is really helping me understand OpenStack! As for the VLAN creation, doesn't the fourth parameter passed in 'nova-manage network create' place the network on a particular VLAN? I usually just run 'nova-manage network create x.x.x.x/28 1 30 10' to create a network on VLAN 10. Please ignore me if the question has already been answered or if this incorrect. I just figure it'll help someone who may later view this post. It seems no effect with the last parameter. Maybe it could be a nice choice in the future. Hmmm, that's a bit odd. I could've sworn I was able to create a network on a particular VLAN. I'll have to test it out again and get back to you. (Unfortunately, I had to tear down my last deployment so it may take a moment). There's som possiblities over this odd situation. 1. I missed a particular flag for specify Vlan ID. 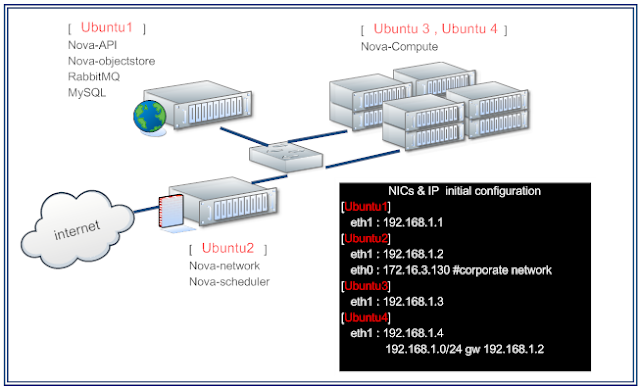 I am new to openstack.. i have installed all the nova-packages on my system using vlanmanager. I wanted to know whether is it possible to add a compute node for implementing a dual node cloud. If yes then please help me with its procedure.